I've always had a problem with Corthay shoes. Not so much the style - while many of the designs and colours are too brash for me, I've consistently found interesting light and dark browns to keep me interested. No, the big issue has been the last shape. It is narrow, and the lack of widths has historically led me to size up to keep my toes comfortable, but have too much room in the back; or get the back right but be too tight around the toes. 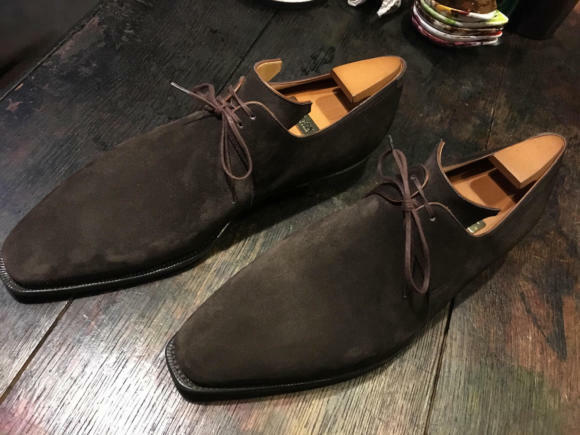 I have three pairs of Corthay shoes, pictured above and below:dark-brown suede Arcas, mid-brown suede Bucys and light/dark brown Wilfrids. and for the internal structure, which is very stiff to start with but softens satisfyingly with time. Indeed, the Wilfrids were my first really expensive pair of shoes. My first double-credit-card purchase - at Leffot in New York, the week it opened. But over the years, these fit issues have meant that all three have been criminally underworn. They've sat there, in the cupboard, gleaming peaceably while others have been selected in their stead. I was interested to hear a couple of years ago, therefore, that Corthay had introduced a wider last - the Pullman, initially - to help cater to American customers. I finally tried that last, and picked up a pair of boots in it, a few weeks ago. It is a wonderful shape, still long and sleek, but subtly wider in the joints. Enough to remove my fit issues, but without sacrificing any of the Corthay look. The model is the Bella - an elasticated ankle boot, pictured below - in black. It's a striking shoe, and one that will have to be carefully worn. Perhaps with charcoal flannel. At the same time as the Bella, I had the staff at the London store look at my other Corthay shoes to try and improve the fit. The Wilfirds had long had a tongue pad put in them - a piece of foam that is inserted underneath the shoe's tongue. I find this is by far the best way to deal with having too much room in the back of the shoe, as it pushes the foot down, where using an insole (the more common alternative) lifts it out. But the Arcas and Bucys had never had this attention. The staff did a good job of stretching the Bucys (which were a size down from the other two, and therefore small in the front rather than large in the back), but have yet to find a solution to the Arcas. Inserting a tongue pad is a lot harder there because they are a derby, and the tongue is therefore the whole front of the shoe. But assuming a solution to this last issue is found, it is happy days for me and my Corthays. The new releases for this year are largely not for me (the Cannes loafer primarily, below). 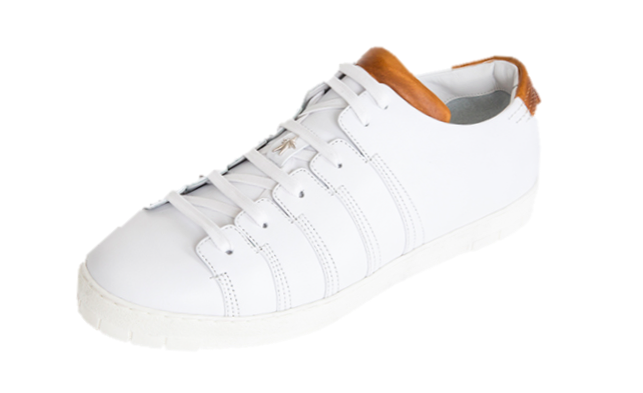 But their sneakers might be interesting (only in white, not metallics or patination, again below). You can follow the discussion on My Corthays – colours, issues and pleasures by entering your email address in the box below. You will then receive an email every time a new comment is added. These will also contain a link to a page where you can stop the alerts, and remove all of your related data from the site. Why on earth would you buy shoes that don’t fit properly? First, these are relatively small points of fit that some might not even consider a problem. Second, they’re really pretty! Alright, thought it was those self-adhesive foam tongue pads you meant. But shouldn’t be a problem for your cobbler to fix this then, stitching might follow a bit shorter but with some skiving and strong cement it should work fine also on the Arca. I know what you mean about the sizing, I happened to be in New York when A trunk show was going on and was fitted. I couldn’t nail down a size so put it down to swollen feet from all the walking round NY. I then tried again in London. my foot is not particularly wide with a low volume but even then I was sizing up. It was even worse when I tried the arca,s because of the two eyelets I could not get them tight enough when sizing up. Doesn’t stop me wanting the Wilfred’s though. An amazing two tone. Can we see a current picture of yours. It would be interesting to see how the patina is holding up after all these years. Yes, same issue with the Arcas. Sure on the Wilfrids, good idea. Hi Simon! Hope you don’t mind me taking advantage of this post to ask for advice… I have just ordered from a tailor a pair of bespoke triusers in tobacco Irish linen (2 pleats “Neapolitan style”). What shoe would be your favorite choice? 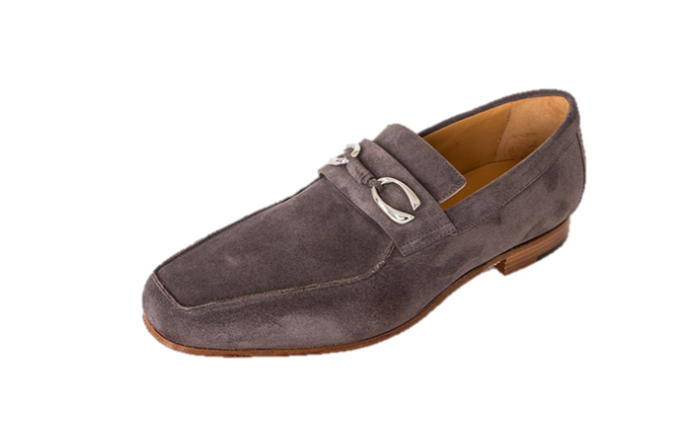 I was thinking about dark brown suede tessel loafers. What do you think? 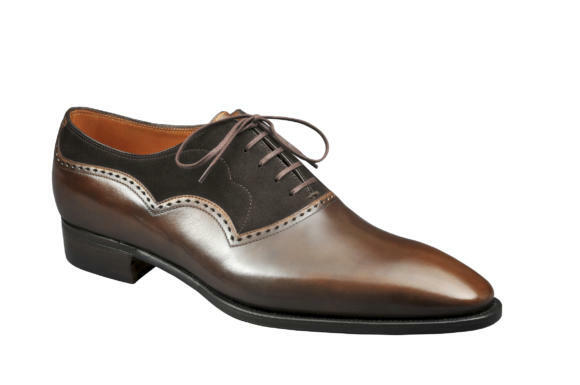 What about dark brown oxfords? Any tip would be highly appreciated! Thanks in advance for your feedback! Thanks Simon. I have the same fit issues of narrow heel and wider front. I use tongue pads and heel grips to help with fit. On Oxfords they work very well. On loafers less so but then loafers always slip a little anyway. It seems my feet have widened over the years resulting in a too tight fit at the toes for a well loved pair of black oxfords (my first pair of good shoes). I had them stretched and will be able to enjoy them for many more years. I think having a good cobbler is as important as a good tailor. 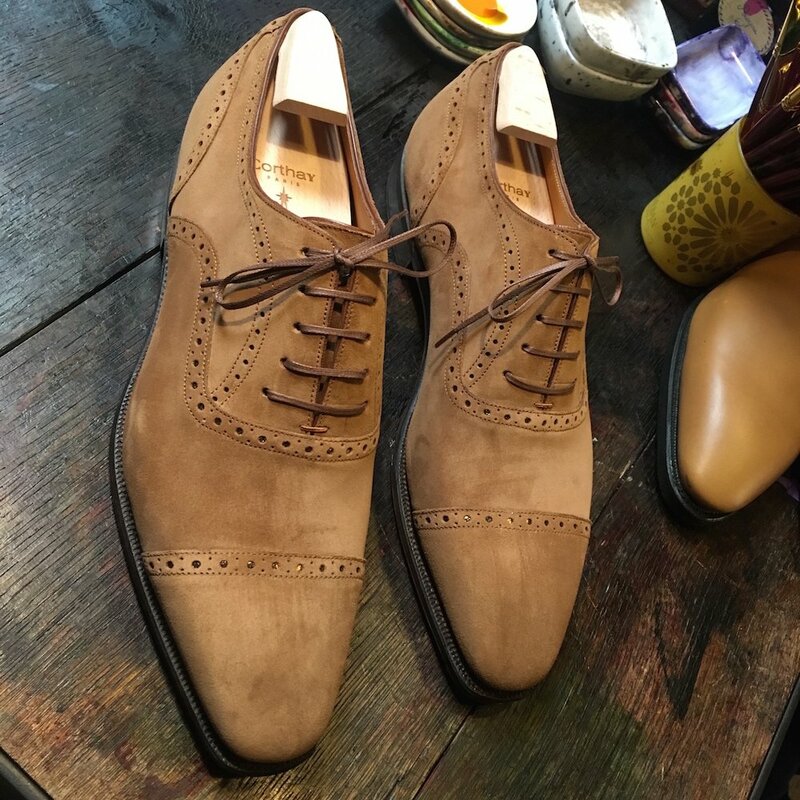 You won’t visit them as frequently but their services are invaluable, especially if you can’t afford or obtain bespoke shoes. Corthay’s shoes are really sharp! I love this shapness and their unusual designs. But unfortunately, they are too sleek to my feet! So my plaisure will solely reside in seing friends wearing them. At times, I just wonder why he wouldnt merely introduce various widths. That would wipe out once and for all the kind of issue you mentionned in your post. Who do you use as a cobbler? I am desperate for someone better than timpsons! Classic Shoe Repairs in Islington get my vote. On the broader subject of buying shoes for those of us who wear supports, orthotics etc is there a manufacturer you would recommend ? It may be worth looking a James Taylor in Paddington St., W1. The Corthay suede/leather brown Wilfrids would, in my opinion, complement the three piece suit on the cover of the Gives&Hawkes book, “One Saville Row”. If you were having that suit made today, knowing the cutters as you do, would you have G&H, A&S, Huntsman, Poole or someone else make the suit? Would you be looking to replicate that precise style? In that case Huntsman or G&H. Andersons would be a different style – a drape cut, with softer shoulders but a more emphasised chest. As with JM Weston and most French shoes Corthay suit only those with relatively narrow feet. For many outside of France (esp. US) the shoes are simply too small. It is a shame as a wider last, combined with Corthay’s flair for design would, I would hope, boost their sales and market presence. Thanks to Inkster also for the tip on Classic shoes in Islington..to have a reccomendation from Manolo Blahnick is recommendation indeed. Re. Weston sizes; the average Weston is an E, UK width size, on average, is F. Worth noting that UK men’s sizes, since the 70’s have increased two sizes to a 10. 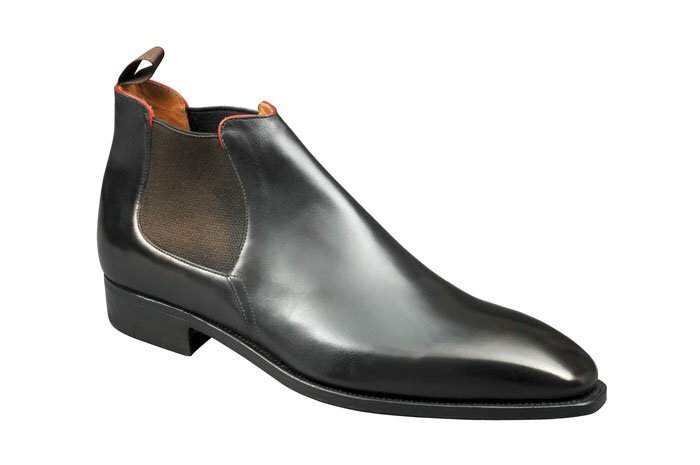 Loake’s largest width fitting is an H. Weston may not be as narrow as Corthay but are narrower than the average UK shoe. Was in Neiman Marcus in Dallas just over a year ago looking at shoes and salesman suggested I try a pair of Corthay’s, the 2 eyelet number. Found it so tight I could not get my foot in which surprised the salesman. Decided not for me so have stuck to Berlutis and Bontonis for shoes that fit OK and have great “patination” and colour. Tom Ford’s “TT shoes are very narrow too. In your experience, how have you found sizing in comparison with the likes of G&G? Sevres last, pullman and 002 (Wilfrid based)? So What sizes did you decide to go for with that in mind? Hi Simon. It’s been about one and a half years since you wrote this post. Just curious as to whether these shoes have entered your regular rotation? Has the pullman last on the Bella been comfortable? Have they aged well btw? Corthay shoes look beautiful to me but I wonder if they aged differently to a sturdy English style shoe. It’s been more comfortable, but to be honest no, they haven’t become part of my regular rotation.